Folks, 318 Days To Go. The hyper for the Windows Phone is over now! It has almost lost its charm as only a few people are using the Windows Phone. 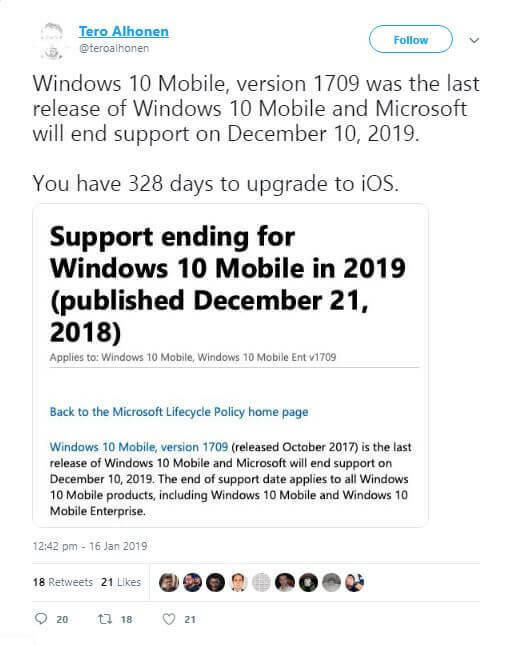 The decline in popularity is blamed to be the reason behind the official end of support by Microsoft on December 10, 2019. It is a perfect time for the Windows Phone users to consider upgrading to a new phone. Why not choose iOS or Android this time? The Windows Phone was launched more than 2 years ago. We have already seen a huge decline in support offered for the Windows Phone by third-party developers. There were a lot of speculations regarding the end of Windows 10 Phone since then. 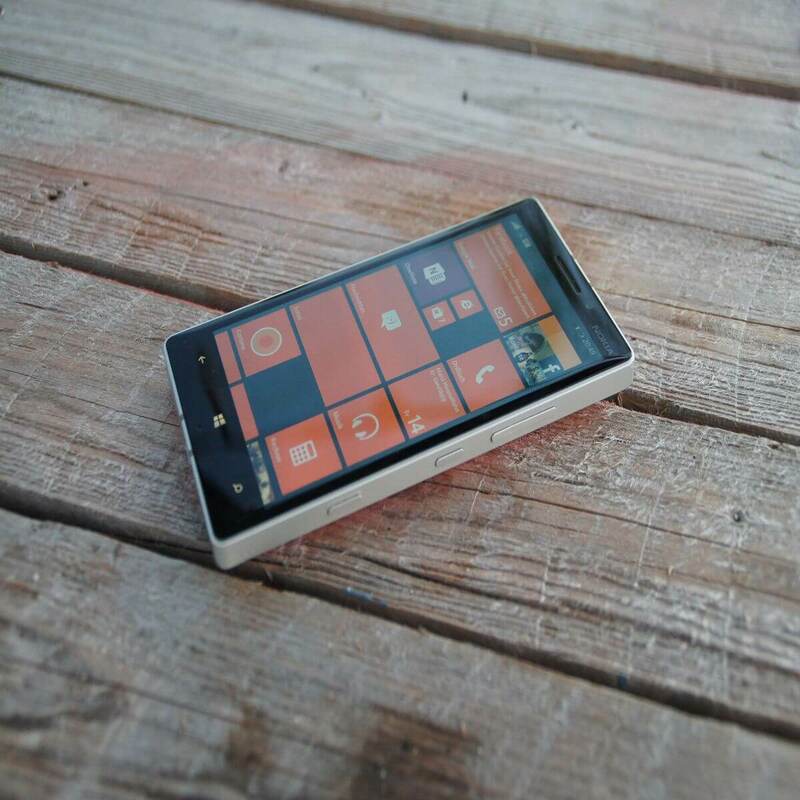 The Windows Phone has received very few features during the last four months. However, it is worth mentioning that the stability of the mobile OS has been improved through a regular collection of tweaks and fixes during that time frame. Microsoft ensured the timely release of security patches and updates. 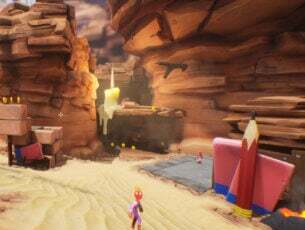 But the company is soon going to discontinue the updates as the end of support date has been officially announced. Notably, the last update to Windows Phone is declared to be the final update for Windows 10 Mobile (version 1709). Although the official support is not provided to most of the mobile phones for so long. So, is Windows 10 Mobile still supported? The tech giant has announced to continue releasing security patches for the Windows Phones until December 10, 2019. Those who continue to use Windows Phone after the deadline should be prepared to face the consequences. 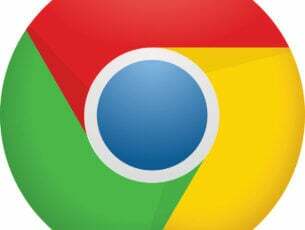 The company has no plans to provide support and monitor vulnerabilities for the users beyond December 10. How did users respond on social media? Following the announcement, Windows phone fans used social media to express their opinions. A mixes reaction has been seen from the users, but most of them are not satisfied with Microsoft’s end of support decision. 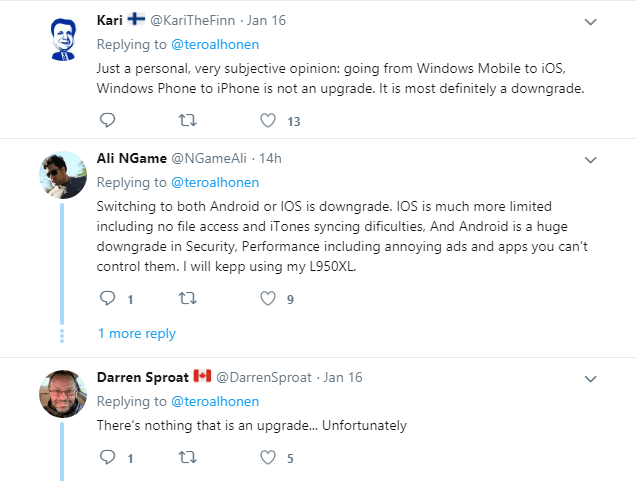 Some of them even referred the switching from Windows Phone to iOS or Android as a downgrade. All Microsoft products including Windows 10 Mobile and Windows 10 Mobile Enterprise will fall under the end of support deadline. The mobile phone enthusiasts have recommended the Windows Phone users to upgrade to iOS or Android. It is yet to be seen that when the long-rumoured Andromeda or Surface Phone will be launched by Microsoft. If you are a loyal Windows user, switching to either iOS or Android is the best alternative for you at the moment.